Councilwoman Kell Criticized For Agendizing LB Voter Survey -- Funded By JetBlue -- As "Update" on JetBlue's "Community Outreach Efforts"
(June 4, 2003, updated June 14 with add'l transcript & text) -- 5th district Councilwoman Kell was publicly chided by some of her fellow Councilmembers, and criticized by LBHUSH2 airport-monitoring homeowners, for placing on the June 3 City Council agenda what her agendizing memo said would be an "update" on JetBlue's "community outreach efforts"...but what turned out to be primarily a survey of LB voters regarding LB Airport, paid for JetBlue Airways. The survey, conducted by a firm retained by JetBlue, concluded that LB voters as a whole unequivocally supported LB Airport as an important part of the LB economy and a convenient transportation option for residents. LBReport.com posts the verbatim survey, a 65 page document in pdf form, on a link below. The document was emailed to us on June 4 as promised following our request on June 3. On the afternoon of June 3, LBReport.com first learned and reported that JetBlue reps had been at LB City Hall and elsewhere discussing some kind of public opinion survey conducted for JetBlue regarding LB Airport...and our report noted that June 3 was the same day Councilwoman Kell had agendized her "community outreach" item. The news spread quickly. By 5:30 p.m., LBHUSH2 leaders Rae Gabelich and Mike Kowal had arrived in the Council chamber visibly displeased at having to drop their daily schedules after being blindsided by Kell's nondescript appearing item...which (as surmised) actually included the high visibility JetBlue funded Airport survey. 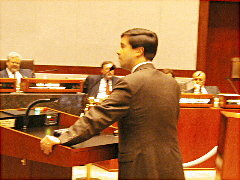 Ms. Gabelich and Mr. Kowal told LBReport.com that no one from Kell's office, or City Hall had told them any such survey of voters regarding the Airport was part of Kell's Airport "community outreach" item. Mr. Kowal said from the podium that 8th district Councilman Rob Webb's office had asked that three Airport related items scheduled for the June 3 meeting -- Kell's JetBlue item, the City Prosecutor's JetBlue Consent Decree item (first reported by LBReport.com), plus city management's CAFR representation (first reported by LBReport.com to contain a reference to Airport flight activity) -- be held until Webb returned from a previously scheduled Council absence. Councilman Webb has confirmed to LBReport.com that he had advised the City Manager and Mayor's office two weeks earlier that he had a conflicting commitment out of LB that would require his absence from the June 3 Council meeting. 8th district resident and Los Cerritos/Bixby Knolls area realtor Mike Kowal told the Council, "Our district tonight is not represented. Our Councilmember could not be here, and the courtesy wasn't extended to him to speak to these items." Of the three items, only the City Prosecutor's item discussing the JetBlue Consent Decree item appears to have been related to breaking events outside City Hall's control. Court approval of the Consent Decree came on May 30, and June 3 was the City Prosecutor's first opportunity to brief the Council and public on the breaking news story. All three items Airport items went through as scheduled notwithstanding Webb's request to hold them. LBReport.com has learned that over a period of roughly two days leading up to the June 3 Council meeting, JetBlue reps held briefings and discussions with Council offices and city management regarding the 50+ page survey performed for them which purports to indicate LB voter attitudes about LB Airport. LBReport.com was told by JetBlue that the meetings ranged from full briefings to telephone contacts and involved nearly every Council office (either with the Councilmember or his/her staff) and city management. Among those also invited to a briefing was Press-Telegram reporter Felix Sanchez. Those attending were provided with a copy of the survey. LBReport.com was not among those told about the survey or briefed. At the June 3 Council meeting, we requested a copy of the complete survey, which was emailed to us on June 4 (as promised). LBReport.com has posted the survey verbatim in pdf form on a link at the conclusion of this article. We post below some extended excerpts of what took place. Our transcript is unofficial, prepared by us. We have also posted the voter survey in its entirety on a link below, which can speak for itself. Not all speakers or statements are included; ellipses indicate deletions; bracketed material included by us for clarity; colloquy was extemporaneous and should be read accordingly. Brian Godbe (survey firm rep): ...Godbe Research and Analysis has been in business since 1990 and we have specialized in doing market research for government agencies like cities, school districts, counties, special districts, transportation agencies, and we've done government affairs work for corporations that have issues that are in front of cities. I'd like to read you the opinions of two residents of the City. 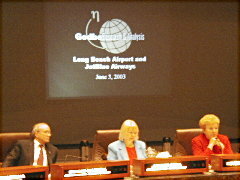 Smith and Brown disagree on their opinions regarding the Long Beach Airport. As I read their opinions, please tell me which one is closer to your own opinion. We randomized the order of the two so there wasn't any position bias. Brown thinks the Long Beach airport should be shut down because it creates traffic, increases the number of people coming through our City, and degrades our air quality. Smith sees the Long Beach Airport as a valuable asset in our community because it stimulates the economy, enhances tourism for our city, creates jobs, and provides a convenient transportation option for residents and visitors. Whose opinion is closer to your own opinion? And we can see here, overall support for the Smith position, which was in favor of the Airport, was 83%. Overall opposition to the Airport was 11.7[%] or 12%. Let me end with about 5% that were undecided or a combination or neither. The Long Beach Airport does not have enough permanent facilities to meet the current demand for parking, waiting areas and facilities, services such as car rentals. In the upcoming months, the Airport is developing a plan to replace temporary facilities at the Airport with more permanent structures. The permanent structures, if built, would not expand the capacity of the Airport, only replace the temporary facilities that exist today. Do you support replacing temporary facilities at the Long Beach Airport with more permanent structures? And then we asked is that definitely or probably, either yes or no? And we can see that we have approximately 79% that said either definitely or probably yes, with over half saying they definitely would support that. Opposition to this question was at about 13% with 7 1/2[%], 8%, saying "do not know" or not answering the question. Councilwoman Reyes-Uranga: You know, when I saw this agenda item I was really excited to find that we were going to get an update on the operations and community outreach of JetBlue. I was hoping also that maybe we could include some outreach efforts from the Airport itself. However, after hearing this market research, it really doesn't relate to anything in terms of community outreach. I don't understand how this agenda item relates. ...On another item [on] overall perception of the Long Beach Airport, it was interesting that you asked two questions...could you just repeat those two questions? 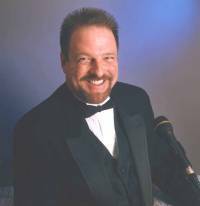 Mr. Williams: Certainly, certainly...and I'll read the question and I�ll tell you kind of what the objective behind them. [verbatim question text above] I'd like to read you the opinion of two residents...Smith sees the Long Beach Airport as a valuable asset in our community because it stimulates the economy and enhances tourism for our city, creates jobs, and provides a convenient transportation option for residents and visitors. Brown thinks the Long Beach Airport should be shut down because it creates traffic, increases the number of people coming through our city, and degrades our air quality. [survey firm rep, hard to discern voice]: Right. Councilwoman Reyes-Uranga: And I guess my concern is, I agree with statement one and I don't agree with statement two that it should be shut down. But I also agree that it shouldn�t be growing out of control, so there�s some in between point where if you ask these types of questions, and I understand market research, and that's why I was upset that it was not community outreach, a report on community outreach, because I think you would have gotten, in market research you develop the questions, you craft the questions to get the answer you want. So if you're going to ask me do I want to shut down the airport, well maybe not, but that doesn�t mean that I totally agree with everything that�s happening there either. Councilwoman Reyes-Uranga: Well, I think even if you ask people who are here that are going to say that they are concerned about the growth of the Airport, they�re not going to say...that maybe it should be shut down. I mean they're realistic, but I thought that that was totally fantasy questioning, but that�s market research, what can I say? Councilwoman Reyes-Uranga: And if that were true, that would be a different story, but there are flights after 10:00 PM and I guess that's the thing, is that when you say "if there are no flights after 10:00 PM, would you be inclined to support the Airport?" Sure, but is that true? Mr. Williams: If you read the question, it says "does not allow flights to be scheduled to arrive or depart after 10:00 PM." So, the point being, is if you heard that, would you that make you more or less likely to support the measure? I guess maybe we need to emphasize "scheduled" there. Councilwoman Reyes-Uranga: Well, I guess we need to discuss that in item 32 of the agenda then [item was City Prosecutor Reeves discussing his office's Consent Decree with JetBlue relating to late night flights], because that's coming up...That�s why when I'm talking about outreach, community outreach, I was really excited to think, hey, you know what? This is a real good educational tool. Let's cross that bridge between those people who really don't know about the Airport, and may be inclined to find out a little bit more, use it as a, not just a slick political thing to say this it what we need to do but, hey, if you can educate people about what's happening there I think you�ll go a lot further than trying to pull the wool over their eyes, which I think some of these questions do. ...And [my] last question is, what political measure are you going to put on the ballot and why did you gather this information I guess I need to know? I know that a community outreach effort is to inform the community, not to try to win some political battle. I mean, hopefully it's about building relationships and so I would hope that someplace down the road that we would get a community outreach report and not a marketing report. Mr. Godbe: Obviously, JetBlue has its internal staff that can speak to that in more detail. I mean our charge is to assess, in a scientific manner, what the community as a whole is thinking about these issues. Councilwoman Reyes-Uranga: Based on your questions. Mr. Godbe: Based on the questions in this survey, that's absolutely true. 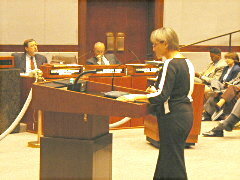 After Councilwoman's Reyes-Uranga's cross-examination, Councilwoman Kell and Mayor O'Neill could be seen conferring off mike...and after Reyes-Uranga concluded, Kell moved the survey reps off mike by inviting Airport area business leader Curt Castagna (Aeroplex) to speak in his capacity as chair of the LB Airport Noise Committee. Mr. Castagna discussed work done by the committee to mitigate noise, and commended JetBlue for recently implementing a new take off procedure after consultations locally that he said produced quieter operations. "Tonight we'd like to recognize JetBlue for their recent commitment in taking proactive measures to negate the impact of their operations on the residents of Long Beach...Through the leadership of JetBlue's Captain Charlie Andrews, a coordinated effort was undertaken with the manufacturer of Airbus, the FAA air traffic control, and through the assistance of our committee and Airport Noise staff, JetBlue was able to design and implement engine and air frame departure procedures that safely allowed their climb out of Long Beach while reducing the actual noise impact into the community. The implementation of this procedure was established on May 2 , and it has a positive effect. Since that time, JetBlue has not violated the noise ordinance and as well as a documented reduction in their noise impact readings. Our committee would like to thank JetBlue for making this significant investment in time and resources..."
"The success of these types of measures would not be possible without the understanding of the Airport staff who recognize our need to maintain timely and accurate noise data reporting. And of course the consistent policy controls provided by you in this Council in upholding the noise ordinance, which has demonstrated its merit in protecting both balanced airport operations and the residential quality of life." "I feel like I just listened to a JetBlue infomercial," Ms. Gabelich said, adding "Never in any time that we have come before Council to discuss our concerns over Airport expansion have we tried to degrade or put down the operation of JetBlue. We support what they do and what they provide for the community, but we do not support growth at this Airport..."
[addressing herself directly to Kell] Did you know that this report was about a survey that was done or did you really believe that it was about community outreach? Because I can tell you that if this had been promoted, or publicized, you would have a full auditorium." Councilwoman Kell did not publicly answer Ms. Gabelich's query, but in a telephone conversation with LBReport.com prior to the start of the Council meeting, Councilwoman Kell said she was aware when agendized the item that it would involve presentation of a JetBlue funded public opinion survey. She said she had not seen the survey before agendizing the item but was told it would be a factual presentation. She acknowledged that she and others were briefed on the survey before the Council meeting. Other members of the public, including LB realtor Joe Sopo, came to the podium, critical of the Council proceedings. Mr. Sopo commented, "If the Airbus is so clean, I'm sure that the Council won't mind if we have a health risk assessment included in the [Airport terminal project] EIR. And I'm glad we got to the part [of the survey] that only 10% of the people who do use Long Beach Airport live in the City of Long Beach..."
As the item wound to a conclusion, Councilwoman Laura Richardson said diplomatically, "I think we just experienced a one-hour example of what semantics means...I think probably in hindsight, had we just said we're going to give a report on a study done on what people think about the Airport in Long Beach, we wouldn't have heard probably 50-70% of these comments because there just was clearly a misunderstanding of what the purpose was tonight..."
Councilwoman Richardson added, "In the briefing I had today regarding this issue, I want to reassure the public that's here, there was no discussion about talking about making the airport bigger, about doing more flights than what has already been discussed here multiple times. There was no discussion about that at all. So, I got no impression that that was the desire of the presenters today to kind of slip something in..."
Councilwoman Kell moved to receive and file the survey...and it was. To view the survey in pdf form (65 pages, approx. 2.5 MB), click Survey of Long Beach Voters Conducted For JetBlue Airways.